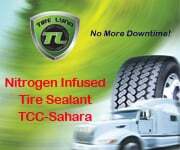 The latest product to Lyna's product line, NitrogenInfused Tire Lyna Sahara is the result of 5 years of real world experience and the latest in scientific laboratory testing. Nitrogen Infused Tire Lyna Sahara is specifically designed for use on Commercial trailers, logging trucks,mining trucks and industrial/agri-turf equipment tires. Scientist have long heralded the benefits of nitrogen-inflated tires; as laboratory studies have consistently shown time after time that when compared to traditional compressed air, nitrogen enriched tires maintain air pressure longer.